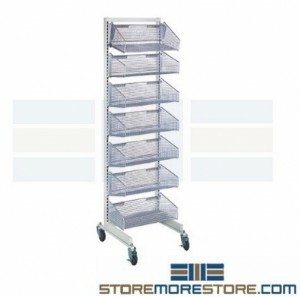 Wire basket carts with pull-out drawers and shelves were created with the storage of medical, electronic, food, and industrial applications in mind. Supply storage for these industries can be difficult because storage areas have to be kept consistently clean and free of dust. And if spillage occurs in a food storage area, it needs to be able to be cleaned up quickly and easily. 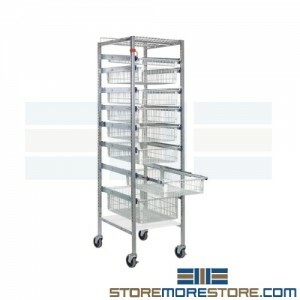 Wire baskets allow just that, while the pull-out drawers allow you to store in less space while casters offer easy transport. The wire basket carts help promote a clean, ventilated storage environment for items that need to be kept free of dust, spills, dirt, etc. Wire construction doesn’t allow for dust build-up on the shelves, and they are easy to clean and keep clean, which saves you time and ensures your storage is in top condition. 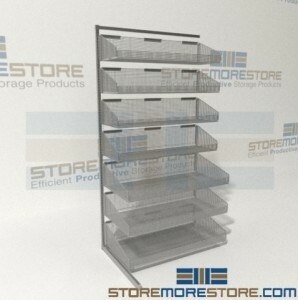 They’re also great for bulk parts storage and other items that aren’t suitable for storage on flat shelves. For ease of distribution and restocking, the carts can simply be rolled to your desired location. 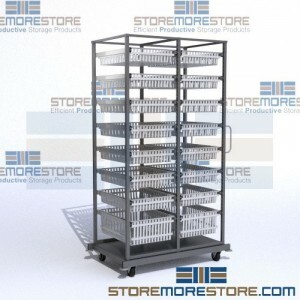 The carts are available in standard- and heavy-duty configurations depending on your needs. Wire basket carts are available to buy online at our store and ship with easy do-it-yourself instructions. If you need additional information or just want some help with deciding which cart configuration would be right for you , call us at 1-855-786-7667.